My girls have developed an interest in history this summer. 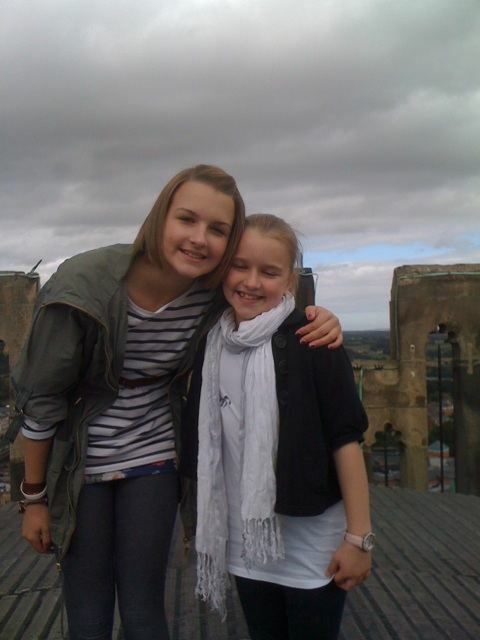 This is us on the top of Durham Cathedral. Walking around such a place certainly captures the imagination. What vision!! It’s incredible to read words written about ordinary people who contributed to something which has become extraordinary. Especially as they never built it with being extraordinary in mind. To them it was just something they should do. Whatever the cost. Building anything takes time, something we are often not willing to give. We become impatient. The culture of the day is ‘NOW PLEASE’. Those who built the likes of Durham Cathedral were not building for men though – they were building to HONOUR God. Most didn’t even see it finished, although I’m sure they knew what it would look like in their spirit. What a demonstration of commitment to a vision. What a story they leave. That kind of attitude toward building can often be missing in the church today. We are building for the LONG-TERM, not just for now. We are building something that MUST last beyond our own lifetime. We are building for the GLORY of God, not a moment of recognition. We are trusting God that the IMPACT of what we build will transform thousands of peoples lives. Whatever we do in the building process doesn’t matter. We just need to CONTRIBUTE. Vision needs people who are willing to contribute. Our contribution can take any shape or size. It may not look like what we expect or desire. Our attitude determines how willing we are to contribute. 1. How do I contribute to the vision? 2. Is it enough? How can increase the level of my contribution?